Sept. 7, 2000 -- "Yes, ladies and gentlemen, welcome aboard NASA's Millennium-Two Space Elevator. Your first stop will be the Lunar-level platform before we continue on to the New Frontier Space Colony development. The entire ride will take about 5 hours, so sit back and enjoy the trip. As we rise, be sure to watch outside the window as the curvature of the Earth becomes visible and the sky changes from deep blue to black, truly one of the most breathtaking views you will ever see!" Does this sound like the Sci-Fi Channel or a chapter out of Arthur C. Clarke's, Fountains of Paradise? Well, it's not. It is a real possibility -- a "space elevator" -- that researchers are considering today as a far-out space transportation system for the next century. David Smitherman of NASA/Marshall's Advanced Projects Office has compiled plans for such an elevator that could turn science fiction into reality. His publication, Space Elevators: An Advanced Earth-Space Infrastructure for the New Millennium, is based on findings from a space infrastructure conference held at the Marshall Space Flight Center last year. The workshop included scientists and engineers from government and industry representing various fields such as structures, space tethers, materials, and Earth/space environments. "This is no longer science fiction," said Smitherman. "We came out of the workshop saying, 'We may very well be able to do this.'" A space elevator is essentially a long cable extending from our planet's surface into space with its center of mass at geostationary Earth orbit (GEO), 35,786 km in altitude. 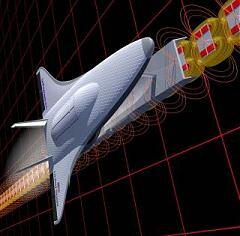 Electromagnetic vehicles traveling along the cable could serve as a mass transportation system for moving people, payloads, and power between Earth and space. Current plans call for a base tower approximately 50 km tall -- the cable would be tethered to the top. To keep the cable structure from tumbling to Earth, it would be attached to a large counterbalance mass beyond geostationary orbit, perhaps an asteroid moved into place for that purpose. "The system requires the center of mass be in geostationary orbit," said Smitherman. "The cable is basically in orbit around the Earth." Four to six "elevator tracks" would extend up the sides of the tower and cable structure going to platforms at different levels. These tracks would allow electromagnetic vehicles to travel at speeds reaching thousands of kilometers-per-hour. Above: Equatorial base sites are essential for space elevators because they align properly with geostationary orbits. In Arthur C. Clarke's novel, Fountains of Paradise, engineers built a space elevator on the mythical island of Taprobane, which was closely based on Sri Lanka, a real island near the southern tip of India. Clarke made one important change to the geography of Sri Lanka/Taprobane: he moved the island 800 km south so that it straddles the equator. At the moment, Sri Lanka lies between 6 and 10 degrees north. According to Smitherman, construction is not feasible today but it could be toward the end of the 21st century. "First we'll develop the technology," said Smitherman. "In 50 years or so, we'll be there. Then, if the need is there, we'll be able to do this. That's the gist of the report." Smitherman's paper credits Arthur C. Clarke with introducing the concept to a broader audience. In his 1978 novel, Fountains of Paradise, engineers construct a space elevator on top of a mountain peak in the mythical island of Taprobane (closely based on Sri Lanka, the country where Clarke now resides). The builders use advanced materials such as the carbon nanofibers now in laboratory study. "His book brought the idea to the general public through the science fiction community," said Smitherman. But Clarke wasn't the first. As early as 1895, a Russian scientist named Konstantin Tsiolkovsky suggested a fanciful "Celestial Castle" in geosynchronous Earth orbit attached to a tower on the ground, not unlike Paris's Eiffel tower. Another Russian, a Leningrad engineer by the name of Yuri Artsutanov, wrote some of the first modern ideas about space elevators in 1960. Published as a non-technical story in Pravda, his story never caught the attention of the West. Science magazine ran a short article in 1966 by John Isaacs, an American oceanographer, about a pair of whisker-thin wires extending to a geostationary satellite. The article ran basically unnoticed. The concept finally came to the attention of the space flight engineering community through a technical paper written in 1975 by Jerome Pearson of the Air Force Research Laboratory. This paper was the inspiration for Clarke's novel. 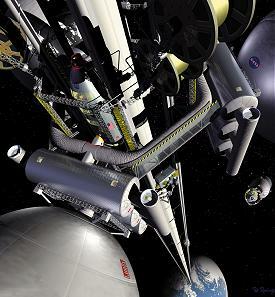 Pearson, who participated in the 1999 workshop, envisions the space elevator as a cost-cutting device for NASA. "One of the fundamental problems we face right now is that it's so unbelievably expensive to get things into orbit," said Pearson. "The space elevator may be the answer." The workshop's findings determined the energy required to move a payload by space elevator from the ground to geostationary orbit could remain relatively low. Using today's energy costs, researchers figured a 12,000-kg Space Shuttle payload would cost no more than $17,700 for an elevator trip to GEO. A passenger with baggage at 150 kg might cost only $222! "Compare that to today's cost of around $10,000 per pound ($22,000 per kg)," said Smitherman. "Potentially, we're talking about just a few dollars per kg with the elevator." During the workshop, issues pertinent to transforming the concept from science fiction to reality were discussed in detail. "What the workshop found was there are real materials in laboratories today that may be strong enough to construct this type of system," said Smitherman. Smitherman listed five primary technology thrusts as critical to the development of the elevator. First was the development of high-strength materials for both the cables (tethers) and the tower. In a 1998 report, NASA applications of molecular nanotechnology, researchers noted that "maximum stress [on a space elevator cable] is at geosynchronous altitude so the cable must be thickest there and taper exponentially as it approaches Earth. Any potential material may be characterized by the taper factor -- the ratio between the cable's radius at geosynchronous altitude and at the Earth's surface. For steel the taper factor is tens of thousands -- clearly impossible. For diamond, the taper factor is 21.9 including a safety factor. Diamond is, however, brittle. Carbon nanotubes have a strength in tension similar to diamond, but bundles of these nanometer-scale radius tubes shouldn't propagate cracks nearly as well as the diamond tetrahedral lattice." Fiber materials such as graphite, alumina, and quartz have exhibited tensile strengths greater than 20 GPa (Giga-Pascals, a unit of measurement for tensile strength) during laboratory testing for cable tethers. The desired strength for the space elevator is about 62 GPa. Carbon nanotubes have exceeded all other materials and appear to have a theoretical strength far above the desired range for space elevator structures. "The development of carbon nanotubes shows real promise," said Smitherman. "They're lightweight materials that are 100 times stronger than steel." Third was the introduction of lightweight, composite structural materials to the general construction industry for the development of taller towers and buildings. "Buildings and towers can be constructed many kilometers high today using conventional construction materials and methods," said Smitherman. "There simply has not been a demonstrated need to do this that justifies the expense." Better materials may reduce the costs and make larger structures economical. "Clarke answered, 'Probably about 50 years after everybody quits laughing,'" related Pearson. "He's got a point. Once you stop dismissing something as unattainable, then you start working on its development. This is exciting!" NASA applications of molecular nanotechnology- learn more about carbon nanfibers and how they may be used with space elevators. Nanotechnology Gallery - more information about carbon nanfibers.